Admittedly, I jumped on the Bottura bandwagon a little late in the game. It was after watching the first episode of Netfix’s Chef’s Table featuring Massimo Bottura that I became an immediate fan of his passion for food and living life. A little background on Bottura. His three-Michelin-star restaurant Osteria Francescana won No. 1 in The World’s 50 Best Restaurants 2016 and came in at No. 2 at this year’s awards. In addition to being one of the best chefs in the world, he’s known for his fervent energy, drive and dynamic personality. Most recently his restaurant was featured on the new season of the much beloved and surprisingly food-centric show, Master of None. Furthermore, equally as passionate about his cuisine as he is about food sustainability, Bottura is the founder of Food for Soul, a nonnprofit that seeks to eliminate food waste in support of social inclusion and individual well-being. Recently I attended the Institute of Culinary Education’s (ICE) first-ever Zero Waste Food Conference, a two-day event focused on discovering better methods for the way we produce, distribute, consume and dispose of food in cooking and dining environments. It was here that I listened to Bottura’s keynote address on his mission to empower communities though sharing meals that go beyond simply filling the stomach. Food for Soul began as a project during the Expo 2015 in Milan, of which the theme was “Feed the Planet.” From this initial prompt, Bottura created Refettorio Ambrosiano by teaming up with well-known artists and designers to help transform an abandoned theatre into an inspiring community kitchen. 1. Quality of ideas: “Creativity and expertise make the quality of ideas and are the keys to working with reclaimed food with surplus.” It’s no easy task transforming subpar ingredients into delicious dishes. 2. Power of beauty: “People can’t live by food alone. Beauty is what nourishes the soul, it is an invisible good … it’s not only about feeding people, but also how we did that.” Bottura and his team worked to welcome guests one by one, serving each guest at the table as they would a paying customer. The meals transformed into celebrations, which in turn created a revived, ongoing dialogue. 3. Value of hospitality: “Sharing the meal was a gesture of inclusion.” When everyone is welcome at the table, guests, chefs and the greater community are inspired to make change for the greater good. 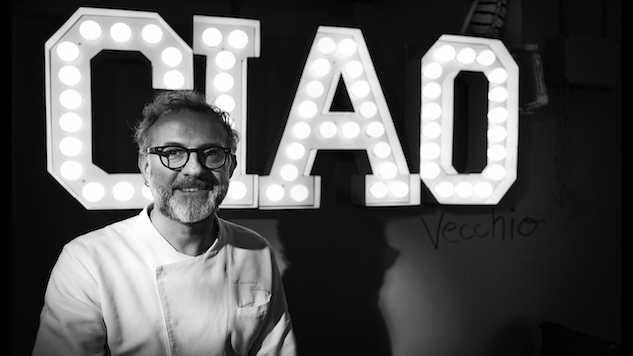 Bottura ascribes to providing nourishment in a holistic sense. For both the body and soul. This inspiring chef is changing the way people approach helping the less fortunate. His roadmap for fighting food waste — while revolutionary — is rooted in a simple concept: treating those in need with respect and dignity. Though Food for Soul is relatively new, it’s been a force to be reckoned with. With the same year as its inception, it opened its first international project: Refettorio Gastromotiva in Rio de Janeiro, during the Olympics, converting surplus food from the Olympic Games into tasty and healthy meals. Soon thereafter, Food for Soul established the Social Tables project in Modena, Italy. Refettorio Felix launched in London in June 2017, and more international projects are in the works in cities including Berlin and Los Angeles. The refettorio initiatives illustrate his approach, offering a relevant template in rethinking food distribution and consumption around the globe. On a larger scale, how can chefs around the world get on board with eliminating waste? Paste spoke with Michael Laiskonis, ICE Creative Director, to find out. Paste: How do you respond to the main question everyone wants answered: how to minimize food waste? Michael Laiskonis: The issue of food waste is both incredibly simple on the surface, yet also requires a deeper look at our entire food system. On a personal scale, there is obviously much we can do be more mindful of our own waste — whether the result of shopping habits, spoilage, or a failure to utilize scraps, and byproducts. At a higher altitude, however, it becomes a political question that can be influenced at every stage of food production and distribution. In the end, it’s a mental shift toward recognizing the true value of food beyond its cost. In the face of an increasingly “disposable” driven culture, we have been slow to respond to this strange dichotomy of abundance on one hand, and crippling food insecurity on the other. ML: Massimo’s work is important and incredibly effective at drawing this connection between two vital issues — waste and hunger/food insecurity. New York City-based group City Harvest was among the first to work with chefs and restaurants in this way, to re-purpose by-product from the industry toward hunger relief — and I’m proud to have worked with them over the years! I love the idea of scaling Massimo’s prototype (even the idea of reclaiming architecture or space in the process,) and I think this could be repeated in communities at a small scale. It’s interesting to consider that by raising the value perception of “scrap” it may also remove some of the stigma for those on the receiving end, who in this case are being fed perhaps with more dignity and respect. But again, solving the wider problem goes far beyond what is essentially charity; the will to carry through on a larger scale, whether city-wide, nation-wide or globally, requires work on the political and economic level. Here in the U.S., programs that merely treat the symptoms of hunger are already under attack; full-scale reform that addresses the underlying causes appears, for the moment, extremely challenging.